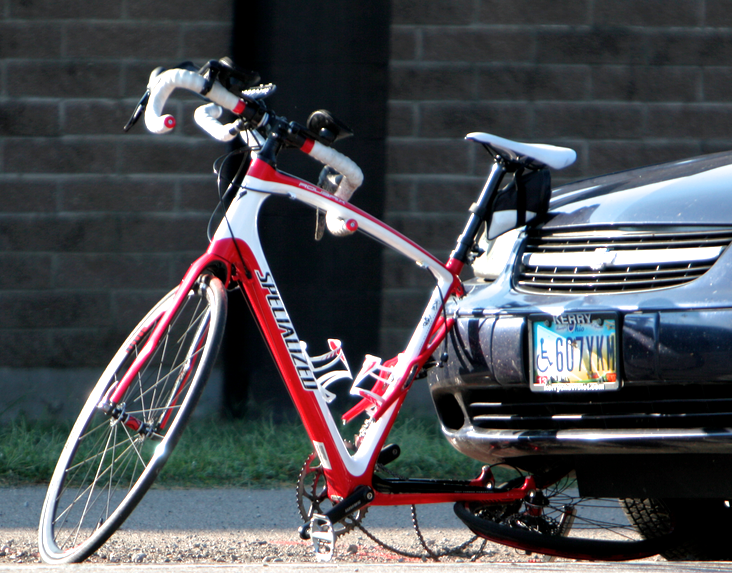 Andrew Gast’s Specialized bike was still stuck in the front end of the car that killed him. Andrew Gast The cyclist apparently didn’t have identification -< insert ROAD ID advertisement here> – so it took some time to figure out who he was. He was clearly riding a high end bike – a carbon Specialized – and was out early as the crash occurred between 6 and 6:30am. The Cincinnati cycling community is pretty tight – the presidents of Queen City Bike and the Cincinnati Cycle Club were in constant contact. No one I reached seemed to know who it might be. Talking to police at the scene, they were working hard to identify the rider. Later we learned that Andrew Gast, age 27, had been killed. From news reports, we learn that he had just moved to Cincinnati, and was living downtown in the upcoming urban Over The Rhine area. He was an investment management and trust asset manager at Fifth Third Bank downtown. His dad told the Cincinnati Enquirer that he was an active young man who enjoyed the urban lifestyle, walked to work and rode every day and was out on his daily ride when he was run down and killed. 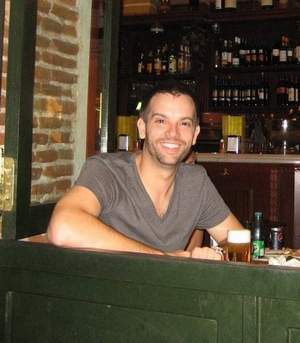 A friend wrote that Mr.Gast loved his OTR loft and the urban lifestyle he had chosen. He was an avid cyclist, purchasing a high end Specialized carbon road bike. He had helped a young woman purchase HER first bike and was teaching her how to ride. 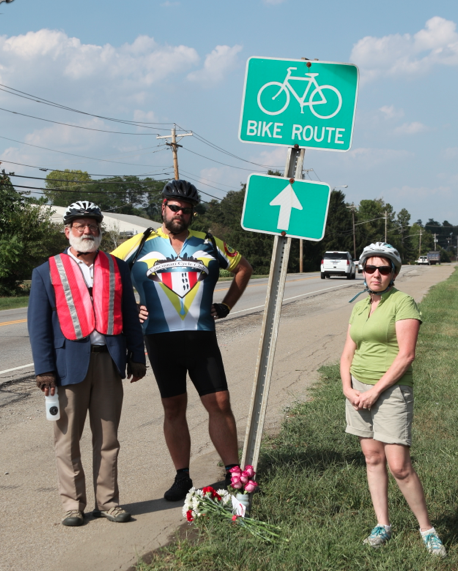 I met this grief-stricken young lady at the crash site on Tuesday – she had been physically sick all day and had come to the scene, as we did, to honor Mr. Gast and try to make sense of a senseless loss. If Mr. Gast had a computer, or Garmin, that data must also be downloaded and analyzed. I have had cases where the Garmin data has proved absolutely critical to figuring out what happened. In one, there was a claim that the cyclist was speeding and Garmin proved those claims to be ridiculous. In another, there was some question of the cyclist’s route, and the Garmin traced it step for step. Did Mr. Gast Have a Light? 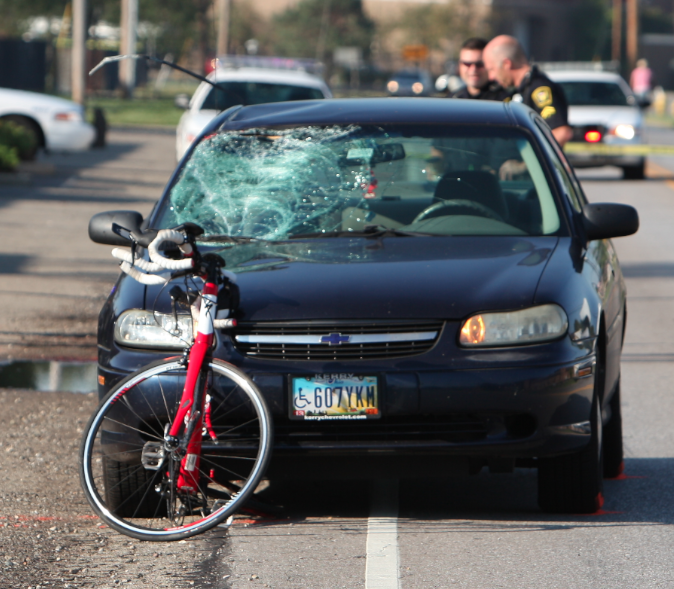 There are a number of issues here… The sun had not come up at the time of the crash and, under Ohio law, both cyclist and motorist were required to be using lights. Dd the rider have a light that met Ohio’s rules for riding a bicycle on the roadway in the dark? Did the motorist have HIS lights on? 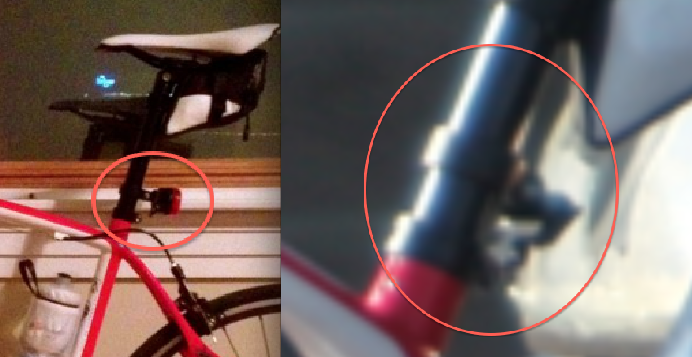 A pre-crash photo of Mr. Gast’s bike posted on his friend’s blog clearly shows a rear light. From my photographs, it certainly appears that the cyclist had a front light and there appears to be a light bracket on his seat post. Media reports of conversations with Mr. Gast’s family and friends depict him as a capable, safe road rider. Assuming this to be the case, I would think police investigators would have found the remnants of the destroyed light at the scene. Here’s a comparison of the pre-crash bike with the light and the bike as it appeared after the crash. Where, On the Roadway, Did The Crash Occur? Where was the Point of Impact? 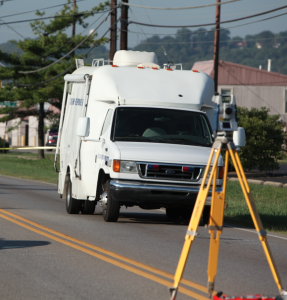 How fast were the vehicles traveling? What were the visibility conditions? [There were reports of fog Tuesday monring.] Were there any witnesses who saw, or heard, the crash. What was said on the 911 calls? What was the angle of impact? What happened to the rider on impact – can this be traced? What physical evidence was found at the scene? 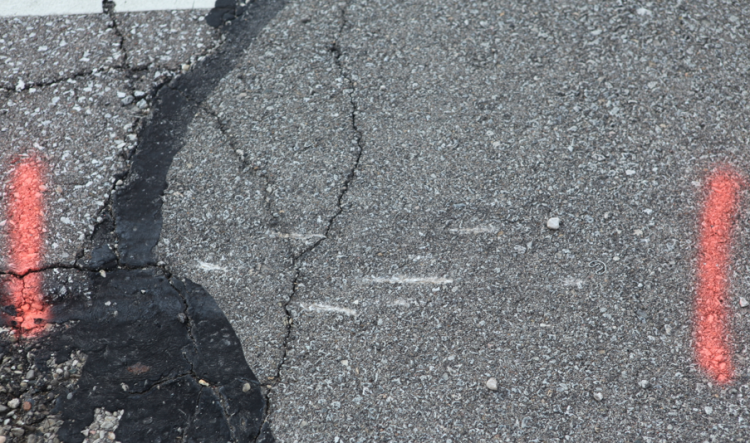 The debris field, skid marks, gouge marks in the road? What injuries were suffered by the rider? Do these add anything to the analysis of speed? To me, standing there and looking at the scene with the bike still stuck in the bumper of the car, it seemed to be a clear “rear-ender.” The car ran into the rear wheel of the bike at a speed high enough the blow the wheel apart, destroy the back end, cause the bike to be locked onto the front bumper and cause the rider, a large man, to smash the windshield and whack the roof. The rear triangle of the bike had been destroyed and the bike was locked against the bumper, still standing upright two hours after the crash. Where on the roadway did the initial impact occur? The police have not given their thoughts. One person who has posted on one of the many media stories, and who claims to be the driver’s daughter, stated that “the bike was in the lane” – which may be true. From my view of the scene, however, the location of the “gouges” and other points marked by police and the final rest, I believe the bike was either in the lane, close to the white line, or just to the right of the white line at impact. I returned to the site in the late afternoon on Tuesday to see what police had marked. I didn’t measure off the entire length of the scene but I’m guessing it was 50 yards or so. 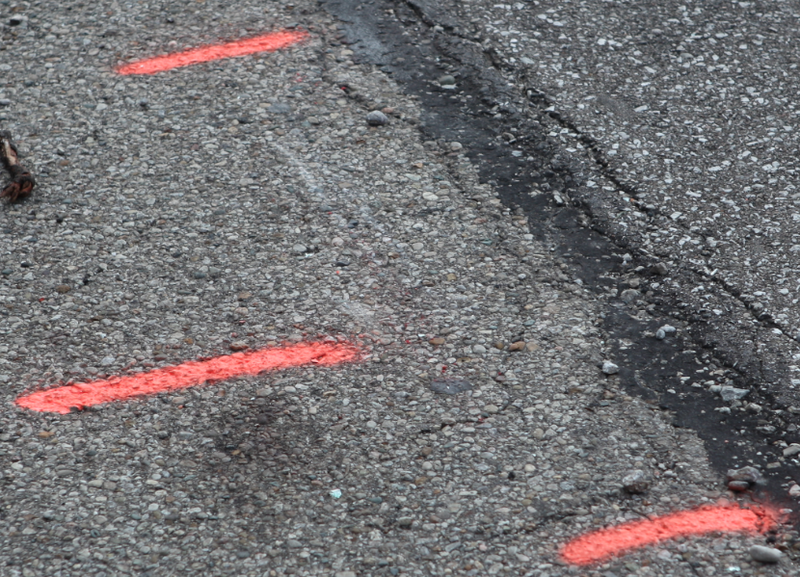 The investigation team had highlighted several areas with orange paint. 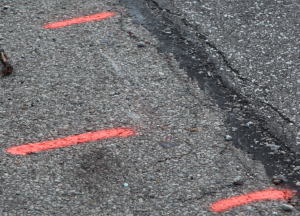 From my vantage point behind the police tape, for example, we could see how the police sprayed paint around the tires of the car at final rest – and how they marked the location of the bike. 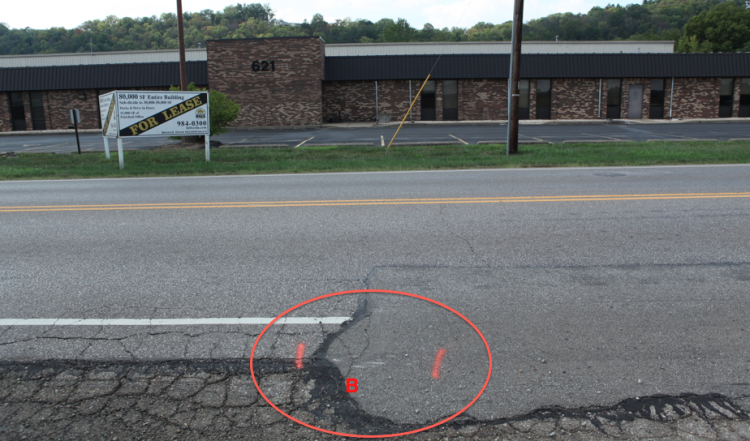 This is a view in the direction Mr. Gast and the motorist were traveling – it is an overview of the crash site. 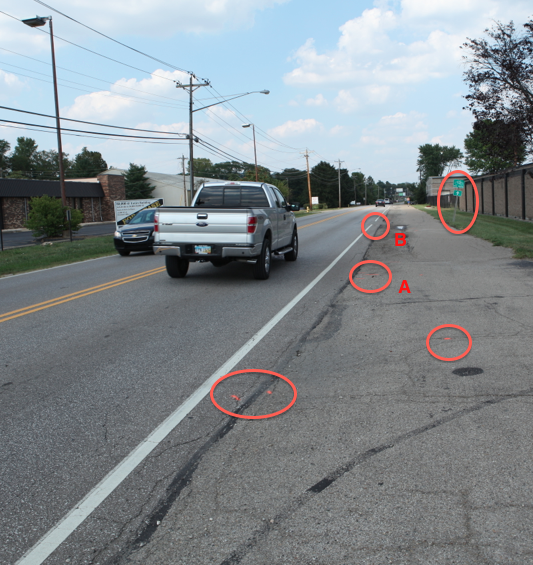 The red circles denote areas which were “painted” by police investigators. The points A and B are discussed in more detail below. 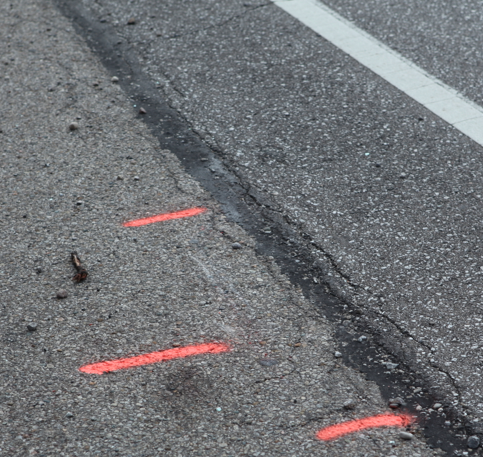 I’m not sure what the orange in the foreground was intended to show… often crash investigators will mark the location of the debris field from the crash – where stuff landed. However, I could not get close enough to see this in the morning, and there was nothing obvious remaining later. I circled the sign marking the bike route as this was the approximate location of the car and bike at final rest. Points A and B were different. Point A is shown up close. Between the orange police paint appears to be a series of gouge marks on the roadway, presumably made by the bike being pushed along the ground. The marks are in line with Point B, and with the final rest. The key point is that they are to the right of the white line. Point B is closer to the final rest. 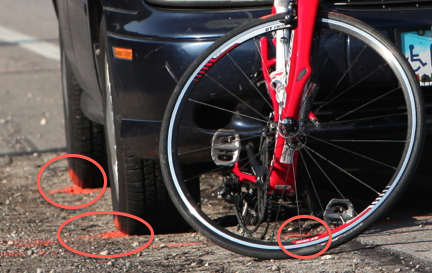 Again, these appear to be gouge marks in the road caused by the car pushing the broken bike forward. There has already been a LOT of “commentary” about this crash on various media sites – much of it from folks who have absolutely no clue what happened. The “car” people scream that bikes should not be on the road, and some “bike” people scream that car drivers are out to get them and deliberately “buzz” or target cyclists. MANY folks have tried to do perform their “analysis” of this particular crash from a single story or photo and add their endless speculation about handicapped plates, cell phones or whatever, with no factual basis at all. As noted, the police are not talking at this point. They are doing THEIR analysis, which can be a tedious & time consuming effort. What I am attempting to present here is one man’s initial thoughts on what may be gleaned from the scene. I have NO insight into the “why” of this. However, from handling 300+ “bike” cases and many complex crash cases, and from working with some of the top accident reconstructionists in the country, I feel in a bit better position to review and analyze what I personally observed at the scene. To me, the bottom line is that the cyclist had the right of way, and had the right to expect to ride forward and not be run over. I believe he was probably riding “legally” – with a legal rear light in the dark and towards the right side of the lane – if not to the right of the white line. I do not believe anything intentional or nefarious occurred here – the motorist screwed up – maybe he was tired, maybe he was “overdriving his headlights” as many folks do in the dark or fog – but the bottom line, to me, is that the evidence points to a death caused by the careless, negligent operation of a vehicle by Mr. White. In Ohio, unlike many states, careless, stupid, negligent driving which leads to the death of another can be deemed criminal misconduct. If this crash had occurred in New York City, it likely would not have even been “investigated”- it would have been considered an “insurance” matter. In other states, a “pay-out” ticket for a rear-ender may have issued. Here, police and prosecutors have the option of looking closely at this crash and determining if serious manslaughter, or homicide charges are justified. 2010 Bike Crash Stats – 2010 Bike PEOPLE Killed! Steve, thank you for your detailed and careful examination of this crash, and other fatal crashes. This isn’t easy work, and even much less so is it pleasant work, but it is important work in the interest of justice, and crash prevention. You suggest that cyclists carry a “Garmin”. That is one brand of GPS device. Most GPS devices are intended only to provide directions, based on an internal road-map database. Some bicycle-specific Garmin models (and perhaps some of other brands) can record the bicyclist’s progress and download it to a personal computer, also upload a route from the computer or from an online database. Only these units are suitable for bicyclists to track their routes, or useful in a crash investigation. Dedicated GPS units are expensive theft bait on a bicycle used for urban transportation — but there is an alternative. Most smartphones include GPS, and can be configured to record a route and/or send route data to an external location (even better, in case the smartphone is destroyed in the crash). A smartphone might be mounted on the handlebar for use as a GPS, but the cyclist then would pocket it when dismounting. There was a fatal car-bike collision in Anchorage, Alaska a few months ago in which smartphone data identified the route the cyclist was taking, see this news story. A helmet- or bicycle-mounted video camera also can provide crash data, if the cyclist is willing to go to the trouble and expense. The size of the files these cameras generate makes it impractical or expensive to send out data in real time, though. John – Good points, all. Steve, I too was at the scene a couple hours after Andrew died, and drew the same conclusions as you (without your comprehensive analyses, obviously, for which I thank you). I submitted this letter to the Enquirer but haven’t heard so I assume they aren’t going to use it. Richard Gast should not have had to be on the defensive two days after his son Andrew was killed while riding his bicycle on Wilmer. (Enquirer, “Father: Cyclist a safe rider”) He was probably forced to assert that his son was doing nothing wrong at least in part because the initial reporting of this tragedy seemed to suggest the fault was with the cyclist. The line “It was not clear why Gast was riding on the road instead of on the bike path along the side of the road…”remained in the evolving coverage that day. The online outcry from cyclists probably helped to direct story expansion that explained exactly why Gast was on the road: cyclists have the same right to be there as automobile drivers. A cyclist quoted in the story said that Cincinnati streets are generally safe for cyclists “if they abide by safety rules.” To readers—especially the casual or uninformed—this probably reinforced the impression that Gast must have been at fault, even though later in the story the commenter describes the unsafe trail conditions along Wilmer. Andrew was a safe cyclist, based on what has been reported since. And I don’t know what the driver who killed Andrew did or didn’t do. The fact is, currently there’s no safe way for a cyclist to travel on Wilmer or on many of our roads. It’s more than the trail and road conditions, though. Trail pedestrians and automobile drivers alike seem to have little understanding of how small the margin of error is for cyclists. Yes, on that portion of the Lunken trail I fear being thrown off my bike by any portion of the jagged sidewalk. But the dangers are increased by uninformed pedestrians who walk two- and three-abreast even when faster trail traffic is coming in both directions, parents letting toddlers on tricycles dart all over the path, or dog guardians not controlling their animals. Sure, bikes have to yield, but we can’t always stop in time for the unexpected. I choose the trail, after riding on Wilmer and having drivers cut me off or whiz by, inches from me, to make their point. That day, being on the trail might have saved Andrew. Another day, who knows? Cyclist, pick your poison. Do most people know that there’s a three-foot passing law, or that forcing a bike into a narrow path can be deadly if there happens to be any road irregularity? The driver’s life will change, too, if he kills a cyclist. Our streets need to be safe for cyclists and currently our community is just beginning to understand cycling. Things are changing and we’re making progress. It’s going to take a combination of things. Roads redesigned to be bike-safe, bike-friendly. Public education—in part by reporters who also are learning about biking issues. And by more and more people riding. It will help when everybody loves someone who rides. Someday, a dad like Richard Gast won’t have to be on the defensive at a time when all he should have to do is mourn his son’s tragic death–better yet, maybe he’ll have no reason to mourn. Thanks for your post and additional details. For that type of damage to occur to the bike and rider, the speed of impact must have been quite high. If the rider was moving at least 15MPH, what would be your estimate of the car’s speed at the time of impact? This was no 10 or 15MPH differential, likely much higher than that. Now, can people die in low speed crashes? – yes, absolutely – the higher the speed, the more LIKELY someone will be killed – here, we don’t have all the data the police will use to evaluate speed but it sure LOOKS like a big hit, eh? Steve, thanks for the pictures and analysis. One article I read said it took 155 ft for the motorist to stop. Speed tables would put the car as traveling at 35-40 MPH, probably typical for the area and not excessive, unless it was foggy and dark, which it likely was. Anyway, I commute slightly later along Riverside Drive and Kellogg out to the Water Works and since the accident I have had a driver in a red car yell out “Road Kill! as I passed his slowing west bound car near Wilmer, headed east. 2 Days later I believe the same guy at the same location yelled something like “Die you f—ing Slimeball!” Today, again in the same location a guy in a beige minivan, yelled “Get out of the F–ing road! This is after 35 years of seldom hearing negative comments. I just thought someone should know there appear to be cretins out there that would do us harm, if given half a chance. I am curious to what actions our legal system has taken in regards to criminal charges being filed against Mr. White. Thanks for the note. Criminal Charges are pending against Mr. White. A Pre Trial is set in the case for February. This will allow the attorneys to let the court know how close they are to being ready to try the case. They may pick a Trial date at that point. The possibility of a plea is always there as well. At this point we haven’t heard anything “official” from anyone in the case.